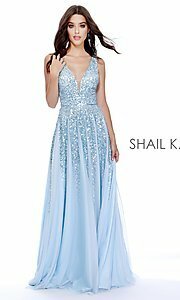 From Shail K, this long a-line prom dress is a gorgeous choice for your next big formal. 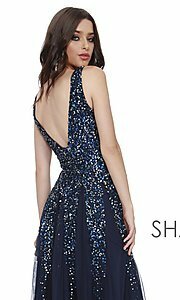 Sequins sparkle over the soft tulle fabric of the floor-length evening dress and keep attention on the design as they extend down the skirt in bright streaks. 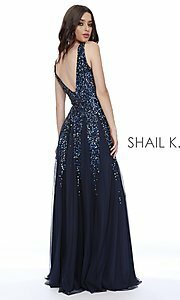 The front of the dazzling sleeveless bodice plunges with a daring deep v-neckline, and the open back matches the v-shape with style. 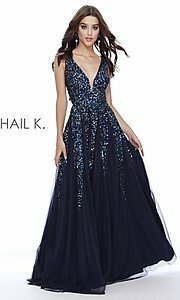 For definition, the bodice skims the figure to the natural waistline, and the flowing tulle skirt on the a-line formal dress bells out to the floor. 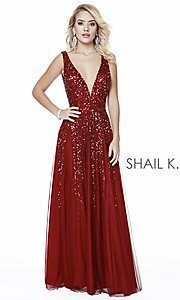 This long designer prom dress is a beautiful choice for prom 2019, fancy galas, military balls, and other formal events.